Tips for Cell Replacement Surgery. This procedure might be commonly referred to as Carticel surgery. The rehabilitation following this type of procedure is a long process. Don’t try to speed it up or you might permanently impede the healing process. Full range of motion should be achieved by the 8th week of the post-op period. This surgery is not intended for a knee that has severe Osteo Arthritis. Follow the rehabilitation protocols that your Physical Therapist and surgeon have put together to achieve the highest level of functional gains. During the course of a lifetime, the human knee joint handles tremendous stress. From daily activities to intense sports, the knee joint effectively withstands compressive and sheer forces, but injuries can occur. Some injuries impact the joint surfaces and damage the cartilage in ways that cannot naturally be restored. While this used to mean partial or total knee replacement it doesn’t always mean that anymore. 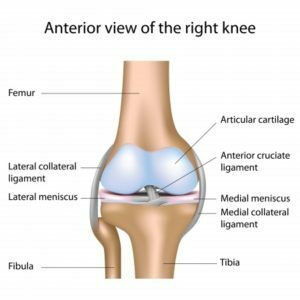 For the past 15+ years, there have been significant advances in surgical techniques to help to “heal” and “repair” damaged articular cartilage. Debridement, micro-fracture and cell replacement surgeries have been used extensively to help prevent the need for a total or partial knee replacement. The knee joint consists of three bones: Femur, Tibia and Patella. The distal end of the Femur has two round condyles, which rest on the proximal, flat Tibial Plateau. The ends of the bones that move upon one another are covered with a smooth surface of cartilage called Hyaline cartilage. The Hyaline cartilage or articular cartilage enables the joint to move with a minimal amount of friction. Sometimes this cartilage gets damaged during daily activities, and this is commonly referred to as a lesion or defect in the cartilage. The lesions are mostly found on the femoral condyles or the trochlear groove. Due to recent developments, these lesions can be repaired in a number of ways, but the most “drastic” and “final” procedure that is performed at this time is cell replacement surgery. 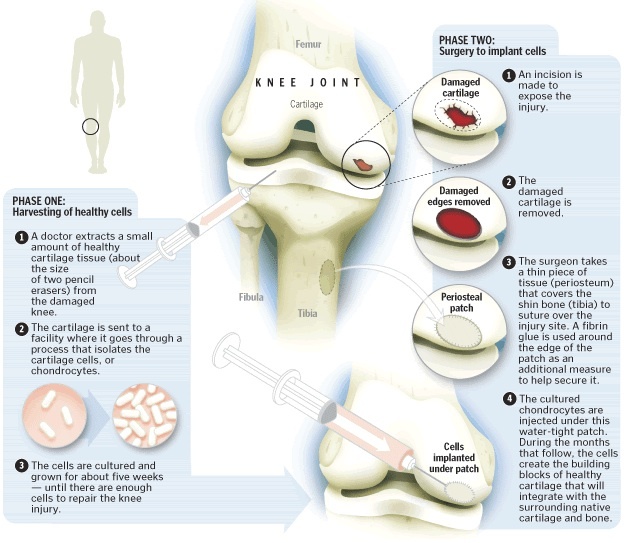 Before cell replacement surgery, the surgeon must “harvest” articular cartilage cells and measure the size of the lesion. Lesions that measure up to 14 cm2 can be repaired. Harvested cells are sent to a lab, Genzyme Biosurgery (located in Cambridge, MA). The lab uses harvested cells to “grow” an autologous “batch” of Chondrocytes (cartilage cells) that will be implanted into the lesion by the surgeon during a future surgical procedure. The surgeon performs cell replacement arthroscopically. During the procedure, the surgeon must debride any loose bodies, have repaired the meniscus previously or perform a partial meniscectomy, and prepare the “floor” of the defect to accept and grow the autologous Chondrocytes. The surgeon will “harvest” a periosteal flap. This is a piece of the periosteal covering of Tibia in most cases. This flap is surgically (painstakingly!) stitched to the perimeter of the lesion. The autologous Chondrocytes are injected via a catheter into the lesion. The cells are deposited in a way that the entire defect is covered and “filled.” The flap is then surgically stitched to completely seal the cells into the lesion. Over the course of the next year, the cells will continue to mature and create solid hyaline cartilage-like “filler” in the lesion. This cell mass is able to withstand similar forces of the original hyaline cartilage. Rehabilitation for this procedure is critical and strict adherence to weight bearing and range of motion restrictions must be followed by the patient and healthcare professionals. In most cases, the patient will be partial-weight bearing for a period of 6-8 weeks. This is determined by the surgeon and based on the size and location of the repaired lesion. The range of motion might be restricted to prevent movement that would compromise the repair patch. Your Physical Therapist will contact your surgeon to assure that the proper protocols are followed while you rehabilitate your knee. Pain: Everyone has a different pain tolerance. In most cases, the arthroscopic procedure produces minor surgical trauma, and the removal and debridement of the joint does not cause a lot of pain. The surgery to remove the periosteal flap and preparing the floor of the lesion can cause a fair amount of swelling. This must be treated with the RICE principles (Rest, Ice, Compression and Elevation) because your doctor won’t allow you to take anti-inflammatory medications. These can inhibit the healing process of the cartilage cells. Braces: You will wake up from the surgery with a large brace of some kind on your repaired knee. The brace will most likely have adjustable hinges on it to protect the repair site and maintain a certain amount of motion. Your surgeon and Physical Therapist will make adjustments to the brace as you progress through the rehabilitation process. The goal is to have full extension from day 1 post-op and achieve full functional flexion (125+ degrees) by the 8th post-op week. Your surgeon will also have you rent a CPM (Continuous Passive Motion) machine for use at home. This machine moves your knee through a set amount of motion very slowly while you rest and recover from the surgical procedure. This machine will be used until you have reached the machine’s maximum limits: 0-120 degrees. Weight bearing: You will be partial weight bearing while using crutches or a walker from day one post-op. In most cases, you are allowed to put a minimal amount of weight on your foot, commonly referred to as “toe touch” gait. Visualize a small, delicate object (similar to a bird egg) that will crack or get crushed if you place too much of your body weight on it. If you do not crack or crush the “egg” then you will not damage the surgical repair. As you progress through the rehabilitation process, you will be given the ok to place more body weight on your involved leg. You will be required to use crutches and wear the brace through out the first 6-8 weeks of the post-op period. Sleep: Sleeping can be difficult. Getting comfortable with the brace or sling on can be challenging. Your Physical Therapist can help you with some strategies that might help. Work: The return to work is dependent of the physical demands of the patient’s job. Most patients can return to some form of limited duty work within a week or two following the surgical procedure. If your job entails standing or walking for long periods of time or distances, you might not be able to return for several weeks. Ask your doctor and Physical Therapist to get an idea how long you will not be able to perform your type of work. Physical Therapy: Your initial Physical Therapy will focus on reducing the swelling and pain following the surgical procedure. In most cases, there will be restrictions to passive motion in the first couple of weeks, but this is dependent upon the size and location of the lesion. During this time period, you should try to maintain or develop good core strength. You will need it to regain full function of the involved joint. Your Physical Therapist will “step-up” the strengthening phase of your rehabilitation program when appropriate, but usually around the 6-8 week of the post-op time period. This surgical procedure is an aggressive way to re-generate cartilage-like material and enable a person to live a higher quality, more active life style by increasing their function and reducing their pain intensity. Many people return to a mildly modified level of their pre-injury/surgery life style.